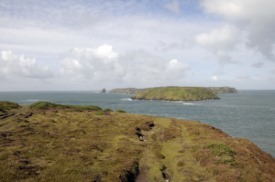 Accessible only by boat, Skomer Island can be found off the southwest coast of Wales. The slopes are covered in bluebells and other wildflowers, and harbor porpoises can be seen swimming in the surrounding waters. Dozens of bird species make Skomer their home, including Razorbills, Manx Shearwaters, Atlantic Puffins, Short-eared Owls, and more.